I’m going to give this a whirl; I’ve posted the equivalent of every day for the past three months, so hopefully I can manage this for reals. NaBloPoMo. It’s inspired by NaNoWriMo, which I could never ever in a million years successfully complete. 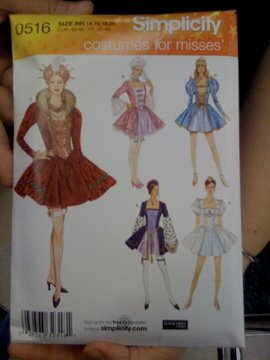 There is so much wrong with these dress patterns that I will only go over the highlights. did I mention mini skirts??? I hope the SCA lynches you. There’s a storm a-brewin’ in library blog land. Last week the Annoyed Librarian had a pretty snarky post about urban fiction and its place in libraries. This was spurred by the New York Times article “From the Streets to the Libraries.” As Wilda Williams rightly points out, however, the NYT is late to the party. The demand for urban fiction is not new, and it seems odd that all this attention is being stirred up now. But, whatever. I’m not going to add my 2¢ and spout off judging the merits, or lack thereof, of urban fiction, or even give my personal opinion about it. That’s not the point. The point is: if a public library that is dedicated to popular materials (as most public libraries are) is not fulfilling a need its patrons have, it should fix that as soon as possible. Just because something is popular doesn’t mean it’s good, but it doesn’t necessarily mean it’s bad either. In other words, if patrons want their public to carry urban fiction because they want to read it, the library should hop to it and order some. If that means that something else that isn’t being read has to go, well, that’s life. MTV has released many many videos from their library–it’s not everything they’ve ever played, but still. Go watch! As someone said elsewhere, since MTV no longer plays music videos, this is sorely needed. 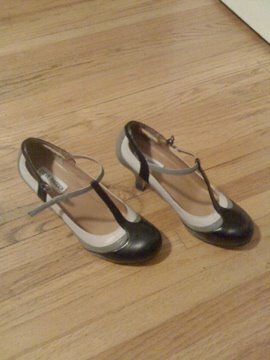 I also got a ton of compliments on my shoes today, including from a little old lady at the library. One of the receptionists at my chiropractor’s apparently checks out what shoes I’m wearing every time I’m in. She liked these too. A young lady came to the desk, wanting to know if we had any books on a specific artist. The only problem was, she was rather vague on his name. She was pretty confidant that it started with an M, and very possibly had a D in it. Something like Monde mumble mumble ray? Maybe? DOA used all of her ref skillz, and came up blank. She passed the young lady over to me, hoping that I would be able to pull something out of thin air. I tried to pry more information out of her: Do you know if this artist is a man or a woman? Do you know when the artist painted? Does the artist paint in a realistic or abstract style? We went back to the art section, and sadly there were no books on Matisse there. (Ironically, I think I weeded them earlier this week.) In another gesture of desperation, I grabbed a Sister Wendy art book and flipped open the index. 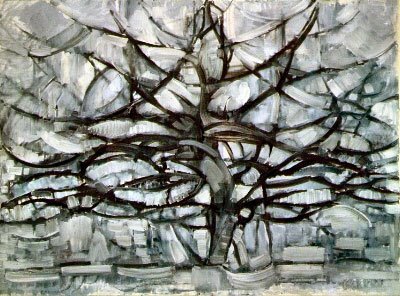 I finally found some Matisse paintings, but none of them rang any bells; the only other tidbit of information that she had been able to come up with was that he had painted a tree, which looked sort of realistic, but sort of abstract at the same time. As I flipped around, trying to find something that could possibly be what and who we were somewhat randomly searching for, she saw something that caught her eye. It looks like I managed to pull success out of thin air after all! So cool! Sadly, it would barely survive the first checkout, but I may know a baby or two that deserves a book this awesome.